House - 2 Master Bedrooms (1 King & 1 Queen Bed), 2.5 Baths, Sleeps 4. Just below Heaven you will find Falcon Ridge - a smoky mountain vacation home nestled high above the treetops at 3900 feet in the heart of Maggie Valley, NC. The home is surrounded by a private wooded lot and located at the end of a long private driveway. There is a feeling of nature and tranquility in the peaceful, outdoor environment yet it’s close to all modern conveniences in Maggie Valley and surrounding areas. Get a bird's eye view of the valley below from every room in the house! Falcon Ridge was built for the view- the incredible breath-taking views. Enter the house and you will find two master bedrooms downstairs. Both bedrooms have large sliding glass doors that take full advantage of the views. The bedroom sliders open to a private lower deck with rocking chairs and a porch swing, a great place to enjoy that morning cup of coffee. We provide you with bath towels, linens and comfortable beds for a good night sleep. There is also a full-size washer and dryer on this level. Head upstairs to the main living area and be blown away with the big, bright, light, open floor plan with views from everywhere. The kitchen is fully stocked with pots, pans, dishes, utensils and small appliances- everything you need to prepare a wonderful meal. The home has a wood burning fireplace on the main living area and is a great place to relax, read a good book or make smores’ with the kids. The patio includes a table which is suitable for enjoying a nice meal or playing games/cards with loved ones. You can barbecue on the outdoor deck using the gas grill then relax and soak away your cares in the hot tub under the stars. We encourage you to open up the door and go for a hike around the property to enjoy all of its natural beauty. This home truly provides you with all the comforts of home. We welcome you to our very clean, beautifully decorated SMOKE-FREE home in Maggie Valley, North Carolina, with a panoramic view of 10 surrounding mountains. You will feel like you are on top of the world. You will have streams and waterfalls nearby; a roaring fire in the wood burning fireplace; hiking and exploring. Sound like a little bit of Heaven? We think so too - a perfect place to get away from all the stress and turmoil of our daily lives. HOT TUB under the stars; fireworks from above, breakfast with a view; relax in the porch rockers and swing away your cares. Read a good book, take a quick hike to the nearby waterfalls, or just relax and do nothing. The wildlife and Carolina birds invite you to bring along your binoculars for up close views. Time to step back and be one with nature. Enjoy PEACE AND QUIET with a breathtaking VIEW, but still be close enough for last minute needs only minutes away. Shop for antiques, mountain crafts and one of a kind momentous. Meet and get to know the friendly, small town residents of this quaint little mountain valley town and view the beautiful valley from above with a view to be etched in your mind forever. Summer temperatures at the house average in the 70's, even though the town of Maggie Valley may experience temperatures in the 80's. The home does have AC however it’s rarely needed. We encourage you to open the sliders and windows and feel cool breeze and fresh air. Great cuddling temperature nights - every night. The last stretch of road to the house is gravel and has 3 switch-backs. It can be a little spooky your first time up and down if you are not used to driving in the mountains. Once you go up and down a time or two, you will be a pro. A 4WD or all-wheel drive is NOT required unless there is ice or snow on the roads. This home is not handicap equipped or motorcycle accessible. Hi there! I was born and raised in South Florida and that there is where I still reside with my wife and 3 children. Living down here in paradise where it’s always summer is great, but when we go on vacation we like to head up to the mountains for a change of scenery. We like Maggie Valley, NC because you get you experience all the seasons. Our goal is to visit our home 4 times a year, one visit for each season. There is so much to do and see no matter what season it is. We have put a lot of work into our house in order to make it feel like your own home away from home. During your stay with us, we hope enjoy all the amenities that the home as to offer. We have one rule– take a deep breath, breathe in the clean mountain air, relax and enjoy the natural beauty that surrounds you. *** UPDATE *** We moved from South Florida to Charlotte, NC in 2016. We fell in love with the mountains and wanted to be closer to the house. Now we are less than a 3 hour drive away and can take advantage of going to the house a lot more. North Carolina gives us a taste of all 4 seasons vs. Florida where its summer all year long. You will love as do I love the altitude of 3900 feet and being so close and private in nature. The views make for a wonderful relaxing visit with so many great restaurants, friendly hometown people and all that nature has to offer. The spring is awesome with all the new spring flowers and rebirth and the fall is just as splendorous in colors bursting out in every direction. Watching the beautiful Carolina birds soar by, with wildlife galore, as well as the peace and tranquility that our home offers with all it's privacy and seclusion makes you feel like Heaven. The hot tub on the deck is a perfect place to look up at the stars on a clear night, watch the fireworks from above as never before, and the clouds create a multitude of fascinating views after a small shower or slight temperature change. The cool night temperatures make night time so restful with the doors and windows open in the summer. Imagine having to cuddle under the quilts on a clear summer night, while the crickets and frogs sing their night time songs. 2.5 Baths to accommodate every guest. Central heat, as well as wood burning fireplace. Plenty of romantic ambience, sunsets and that wonderful wood crackling in the fireplace is sheer heaven. Towels, washcloths, dish towels and cloths are all provided. Plenty of comfortable seating with leather rocker recliner, rocker and sofa to enjoy the fabulous view and fireplace. More than enough tableware, dishes, bowls, wine glasses and serve ware for your stay. Inside dining table seats 6, with additional bar and 2 bar stools. Outside dining seats 6 as well on the deck. Bookshelf contains many great books. If you take one we ask that you leave one. Private Deck off both bedrooms with spectacular views, as well as one off the main living area to view the sunrises and sunsets. A perfect retreat. Lots of places to get your feet wet and cold in the icy mountain waters. Patio seating for 6, plus 2 rocking chairs. Many, many golf courses nearby: Maggie Valley Country Club, Laurel Ridge, Springdale, Waynesville Country Club and so many more just minutes away. Hot tub comfortably seats four on the upper deck for ultimate star gazing and romance. You bring the wine - the rest is there. Great layout with awesome views! Thanks to Brandon for the last minute scheduling change we had to make. We will be back. The absolute perfect honeymoon location! Close to heaven in the sky! Had a wonderful stay at Falcon Ridge in Maggie Valley up on mountain top reaching to the heavens. Such a serene, peaceful quiet retreat, yet close to everything. 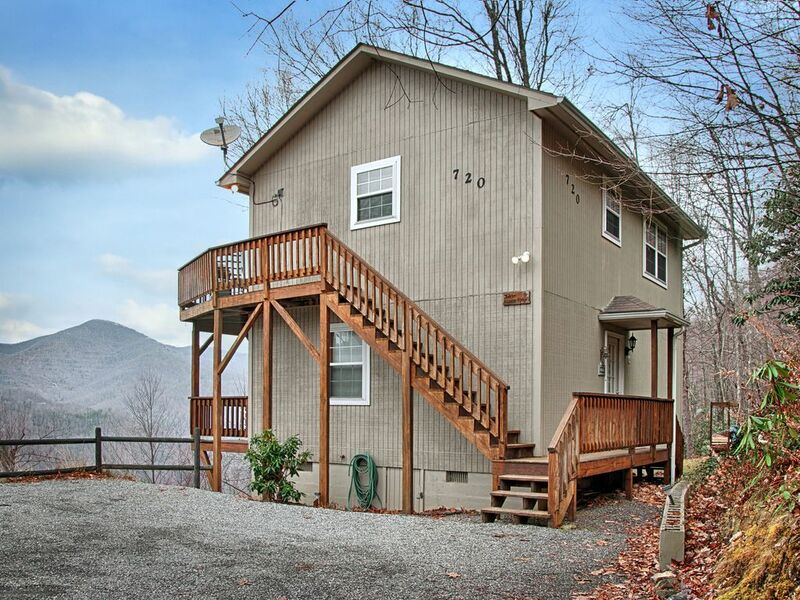 A beautiful cabin with every convenience & a view of the mountains & Maggie Valley. Two porches for relaxing , rocking, swinging & using hot tub, grilling & eating in the clear crisp air....Fireplace was great in the cold evenings. We would recommend the get away in the mountains to anyone wanting a retreat from the hectic busy lifestyle so many have. Stayed 4 nights at Falcon Ridge and enjoyed it very much. If you’re looking for privacy and a magnificent view this is the place. The drive up the mountain is not bad at all! Previous reviews I read had me a little concerned but it really is not bad. Terrific Cabin with astounding VIEWS! When you see all the motels lined up in Maggie Valley along Soco Rd., it makes one feel truly blessed being in Brandon's cabin. Spectacular views abound as do wildlife and nature at it's core. A very clean and well stocked home with all the amenities. Brandon is very easy to communicate with and provides many details and gets back very quickly with all questions. I would definitely heed his suggestion regarding vehicle with front wheel drive at minimum, and having four wheel is best for sure to make the climb up less daunting, particularly Wild Cat Run on up thru Robins Roost. Once done a few times it does get easier and it's pretty quick to get to Soco Rd. ENJOY! MUST SEE attractions include Maggie Valley, Cataloochee Ski Resort and Snow Tubing, Cherokee Indian Reservation and museum, Harrahs Casino in Cherokee (17 mi), Great Smoky Mountains National Park, Blue Ridge Parkway with miles and miles of scenic views of the Great Smoky Mountains and Blue Ridge, Great Smoky Mountain Railroad, Ghost Town in the Sky Amusement Park, Whitewater Rafting, Biltmore Estate and Winery, Antiquing, Hiking, Shopping, Horseback Riding and lots more. Within a short drive you can see the roaming elk in the Cataloochee Valley of the Park, Mountain Farm Museum and Mingus Mill. Only 1 hour away, on the other side of Smoky Mountains National Park, you can visit Dollywood, Gatlinburg, Ripley's Aquarium and museum, and Cades Cove auto loop. So much to see and do!